1. Beat egg whites until frothy, adding 1 cup sugar. Set aside. 2. Mix the sugar, baking powder, flour, salt and soda in a separate bowl. 3. Then add the oil, mashed bananas and 1/2 of the buttermilk and vanilla. Beat for about 2 minutes. Add the rest of the buttermilk and egg yolks. Beat again for about 2 minutes. 4. Fold in the beaten egg whites. Pour into 2 greased 9 inch cake pans and bake 30 minutes in a 350 degree oven. 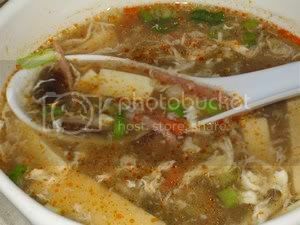 All soups consumed by my family are usually served hot which is temperature and when this soup appears in any menu as Hot and Sour, i expect Hot meant spicy.. So when i make this soup, it is spicy and when i read that this Soup is reputed to be good for colds , i was amazed because every time i have a cold it all started from a sore throat and anything spicy is no no. Then again, if omit the chilli oil and keep soup at temperature Hot would certainly do the cold alot of good. 1. Boil broth/water. When it is boiling add the char choy, mushrooms and wood ear. Simmer until char choy releases its flavor. 2. Add the tofu and when the broth comes back to the boili add the marinated pork. Add the remaining ingredients in (I). 3. Beat the egg well. Set aside. Test the broth and adjust the taste if desired. (If using chicken broth, you may want to add a bit more rice vinegar). 3.. Mix the cornflour and water. Slowly pour the cornflour mixture into the soup, stirring while it is being added. Test the broth and adjust the taste if desired. (If using chicken broth, you may want to add a bit more rice vinegar). Let the broth come back to a boil. As soon as it is boiling, remove the broth from the stove. 4. Slowly drop in the beaten egg, stirring in one direction at the same time. 5. Add garnishes and serve hot. The trick to cooking scallops is to heat them sufficiently to destroy harmful organisms, but not so long as to make the flesh too tough. This requires careful monitoring, as scallops can be toughened by just seconds of overcooking. Scallops undergo a characteristic change when cooked, this can help you judge doneness: They turn opaque and their flesh is just firm, not soft. 1. Remove and discard the tiny muscle on the side of the scallops first and rinse well. 2. 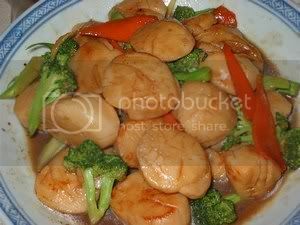 Bring water in pan to boil, blanch scallops for about 3 minutes in water with spring onions, ginger, wine and scallops added, then remove. Alternatively, towel dry scallops and season with kosher salt and pepper. Heat pan with 1 tbsp oil and sear scallops until brown on both sides. Heat 2 tbsp of oil , add in carrots and broccoli . Pour in seasonings and minced garlic, then add scallops and mix well, remove to serving plate . Heat up 1 tbsp of oil, stir fry garlic until fragrant and discard, sizzle Hua Tiau wine. Pour in broth and bring to the boil, add crab meat, squash and seasoning and mix well, bring to the boil again. Add in brandy and vinegar before serving . This is hakka cuisine, that's for sure. Belly pork fried with the nam yee red sauce is very delicious if it has been thoroughly fried, crispy on the outside and meat is juicy inside. Alternatively, making it into a stew with wood ear fungus is the Hakka Classic. 1. Heat up oil, sauté chopped shallot and garlic until fragrant. Add in the remaining ingredients and bring to boil until thick. Done. This sauce may keep in the fridge for 1 month. 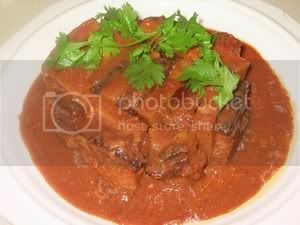 It may also be use in other recipes like fried fish in nam yee red sauce and nam yee spare ribs. 100g wood ear fungus, soak and remove woody part. 1. Combine pork belly with marinade and marinate for 2 hours. 2. Heat up oil for deep-frying, put in pork belly and deep-fry until golden brown, dish and drain. This can be served as is. 3. To stew, put all ingredients, pork belly and water into a stock pot and bring to boil, lower the heat and continue to simmer for 45 minutes or until the pork is tender. 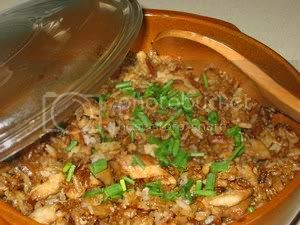 This dish desirably is cooked in a clay pot on charcoal stove as the rice will form a brown , crispy layer at the bottom of clay pot, thus making the rice more fragrant. Nowadays in a modern kitchen, this is not possible but a rice cooker makes a decent pot of rice. Tofu is bland by itself, so it needs a good sauce which is flavorfully salty. In this dish, the salted threadfish will disintergrate into the sauce imparting that special flavor that the tofu needed. 1. Heat up 1 tbsp oil, sauté salted fish until fragrant. 3. Add in shao xin wine, cook until it reduces then add the rest of the seasoning, stir well. 4. Simmer for 30 - 45 minutes with lid on until the meat is tender. 5. Add in tofu and simmer for another 5 minutes. 6. Turn off heat and let sit for 1/2 hour for sauce to marry into the tofu. 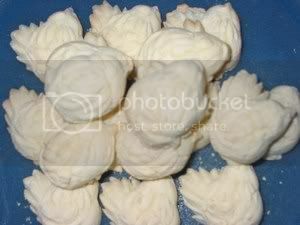 There is alot of egg whites collected from all the chinese new year baking of pineapple tarts and kuih bangkit. Besides that, Alexander's breakfast of egg yolk every morning added up to the piling. I have a recipe for a steamed layer cake which is in my collection of recipes in malaysia. I thought that the recipe posted below would be it but no so. Anyway, it turned out so delicious that this is a sure keeper. 1. Heat the steamer and line the bottom of a 10 inch square tin and grease lightly. 2. In a large bowl, sift the flour, the sugar, baking powder and salt, set aside. 3. In a separate bowl combine the coconut milk, oil, and the egg yolks. 4. Begin whipping the whites in a separate bowl with the cream of tartar. You want to whip until a softly stiff peak. It should form a peak that just turns over at the top. 5. Mix the egg yolk mixture and then mix into the dry ingredients. 7. Then pour the lightened batter to the beaten egg whites. Reaching into the center of the bowl with a rubber spatula, cut vertically through the two ingredients. Then, pull the spatula out to the edge and up, gently folding the denser ingredient over the lighter mixture. With your other hand, rotate the bowl as you go. Stop when the batter looks evenly streaked with beaten egg whites and batter. Do not overdo it or you will deflate the whipped ingredient. 4. 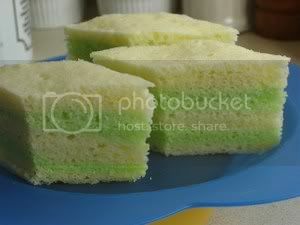 Divide batter into 2 portions and add pandan paste to one portion. 5. 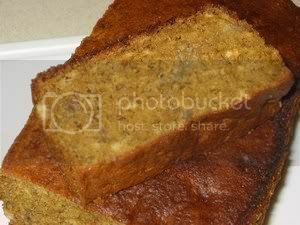 Pour 4 ozs of plain batter(2 scoops of soup ladle) into prepared tin and steam until cooked. Then pour in 4 ozs of green batter and the process is repeated. Complete steaming for another 10 minutes to further cook the cake. 6. Remove from steamer and leave to cool for 10 minutes before removing from tin. 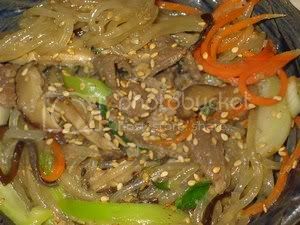 Japchae is a well-loved Korean dish which incorporates virtually any selection of vegetables. Those in season have the best flavor. 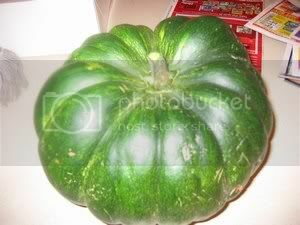 Vegetables are fried seperately in a minimal amount of oil. Other ingredients can include match stick-sliced beef and vermicelli noodles (made from potatoes and sweet potatoes). When each ingredient has been fried and the noodles cooked and cut into short lengths, all the ingredients are combined, sauteed quickly, and seasoned with soy sauce, sesame oil, and sugar. 1. Soak mushrooms in water for 15 minutes. Cut off stems. Cut mushrooms into thin strips. 2. Cut beef into thin strips and marinate it with the mushrooms in a seasoning of: soy sauce, sugar, minced garlic, sesame seed oil, chopped green onions, and a pinch of ground pepper. 3. Cut carrots and onion into thin strips (julienned). 4. Cook spinach in boiling water for about two minutes. Cool spinach in running water. Squeeze the water out of the spinach. Season the spinach slightly with salt and sesame seed oil. 5. Batter and fry the egg in a pan with a pinch of salt. Once cooked and cooled, cut the egg into thin slices. 6. Cook the noodles in boiling water for about 2-4 minutes or until soft (You may want to cut the noodles in half before hand if they are too long). Rinse in cold water and drain. 7. Start cooking the beef and mushrooms with a bit of oil. 8. When beef is cooked add carrot, onion, spinach, and noodles and stir-fry. 9. When vegetables are cooked, add the sliced egg and use salt and soy sauce to season the dish to your taste. 10. Put it all in a dish and sprinkle some sesame seeds for the final touch. 11. Can be served hot or cold. 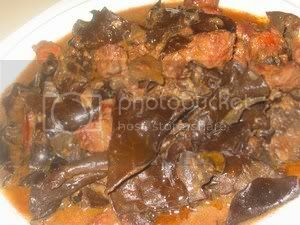 ,This is a classic dish which is served on special occasions. I learned to make this dish from a friend who is hakka, so i presume this is the favorite of the hakka clan. Correct me if i am wrong. 1. Parboil belly pork in boiling water together with cooking wine and spring onions for 10 minutes. Remove wash well and pat dry.Rub the skin with black soya sauce and the meat with 5 spice powder. 2. Heat enough oil for deep frying. Deep-fry the belly pork, skin side downtill light golden. Remove and soak for 1/2 hour in cold water to wash off oil and to regain moisture lost in frying. Slice pork into 1/2 inch pieces and dust with tapioca flour. 3. Deep fry taro slices till golden. Drain well and dust with tapioca flour. 4. Heat wok with a tbsp oil. Sauté shallots and garlic, add in nam yee . Add in the rest of the sauce ingredients. let it come to a boil. 5. 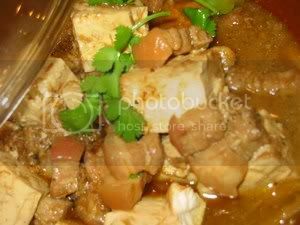 Using a deep dish or a chinese soup bowl, arrange a piece of pork slice and alternate with a piece of fried taro. Repeat with the rest of the pork and taro. Make sure they are packed snuggly in the dish/bowl. 6. Pour the sauce over the assembled platter. 7. Cover the assembled platter with aluminium foil and place into pressure cooker which has an inch of water. Pressurized for 1 hour. Turn off heat and let pressure released by itself. Carefully remove from pressure cooker and remove foil. 8. 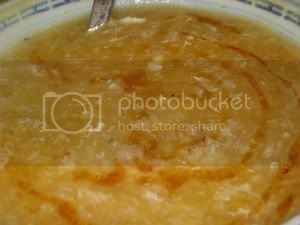 Tilt to remove sauce and if sauce is too thin, it can be thickened with tapioca flour. 9. Put serving plate over assembled platter and turn it over. Pour back the sauce and serve hot. 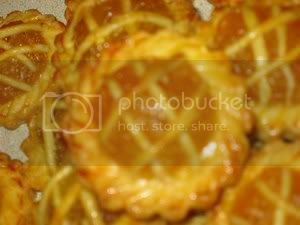 There are recipes and recipes of Kuih Bangkit and what is the expectation of it. It should melt in the mouth and the fragrance and flavor of coconut should be present. Sweetness is to each his own but i found out from my tweeking of recipes that too much sugar in recipe will give the cookie a crispy texture. I started with Little Corner of Mine recipe (thank you Ching)and since i have tasted her finished product, i tweeked by adding 25 gm of coconut powder with pandan flavor, in hope that that the powder will enhance the coconut and pandan flavor. Whenever i cook with coconut milk, i love to add a pinch of sslt. Half of the dough could make a tray of pretty good cookies but i felt it was too crispy and added 1/2 an egg yolk to the remaining dough. The result was promising. Thinking that i have found what i liked, decided to make a new batch with 2 egg yolks which tasted very good but somehow the cookies spread wider. What happened was, i had used 15 gm of coconut powder therefore the dough was much softer. I now prefered this texture and made another batch, this time using a smaller cutter. The cookies came out perfect but oh no, the melted butter is still sitting on the counter. Conclusion is, i could omit butter and return to traditional but i still have crispy cookie although eventually it melts in the mouth. I remembered that Florence from Do What I like did have a recipe for this cookie. I made them and it was what i wanted except that i would have prefered it to be a little sweeter. Thank you Florence for sharing. 1. Line a large pyrex bowl with greaseproof paper, microwave the flour and pandan leaves on high 1 min at a time for 5 times, stirring every minute. 2. Set aside, cool completely before using. 3. Cream margarine with sugar and yolk till sugar dissolves. 4. Add in 75ml coconut milk and mix well. 5. Add flour to mix till a non-sticky dough is formed. If dough is too dry, add more coconut milk but add 1 tsp at a time, otherwise, dough may be too sticky. Leave dough to rest covered with a damp cloth. 6. Take a quarter of the dough and roll dough on a floured table to 3/8 inch(this thickness is necessary to obtain a nice size cookie)and use cookie cutters to cut into shapes. Using a pincher to pinch desired designs. 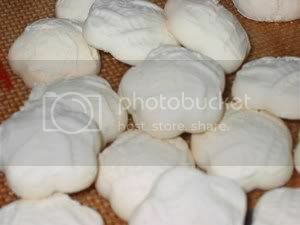 Alternatively wooden moulds can also be used and that omits rolling the dough. 7. Baked on lined tray in preheated oven at 300 f convection for 15 mins. Cookie should not brown. 8. Remove to cool completely before storing . These tarts are a must for the Chinese New Year. The jam is of pineapple and it is quite tedious to cook, so it is once a year affair for these tarts. This year i made the pastry from 3 recipes and they are all delicious but i like this recipe posted below. A fresh pineapple costs about 3 to 4 usd so i used canned crushed or chunk pineapples which is so easy and so much cheaper. I do not have to stand in front of the stove and stir until the cows come home, i cook them in the microwave. 1. Sift A into food processor. 3. Cut chilled butter and margarine into small pieces and add in food processor(Step 1). Pulse until mixture resembles bread crumbs. 4. Pour in egg mixture B:(step 2) and pulse 2 more times, then add in the boiling water. Pulse until it forms a dough. 5. Chill dough in refrigerator for at least 1/2 hour. Cut the chilled pastry into 4. Roll out to 2/8 to 1/4 inch thick and cut with pineapple mould. Space the tarts 1 inch apart and when the whole baking sheet is full, brush with glaze. Fill tarts wtih jam and top with a design. Glaze design. Bake in preheated oven 375 f for 15 mins. Tarts can me moulded by hand into the shape of the pineapple with the jam enclosed. Use a pair of scissor to snip tiny 'v' shapes on the front half of the tart. Snip in rows. Place a clove to resemble the stem. Glaze before baking. My long search for this chilly muruku is over, i have found it. It was the recipe at the back of the pack of gram dhall flour that i brought. from Malaysia. 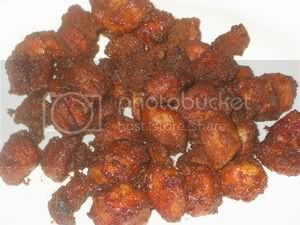 The twirled muruku that has been piped with the star nozzle has to be fried longer and since this recipe has chilly powder, it looked burnt. The single strand is recommended. Place the Gram dhall flour and rice flour into mixing bowl. Add chilly powder, omam seeds, salt and margarine. Add 1/2 cup of thick coconut milk and then gradually add thin coconut milk. mix to form a dough. 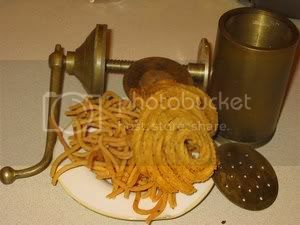 Heat oil, using the muruku press, force the dough into the oil in circles. Fry until crispy, drain muruku on paper towel.